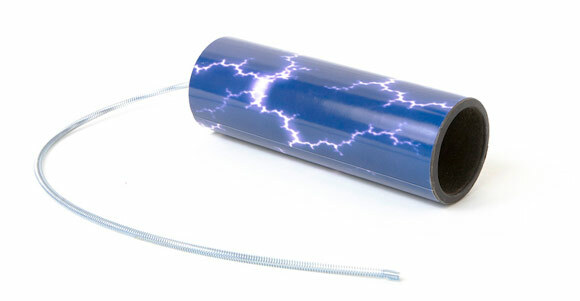 The Remo Thunder Tube: Fun and hackneyed, but aggressive and unusual when played with an eBow! My girlfriend bought be a Remo Thunder Tube as a gift, just as I was getting more comfortable with live microphone techniques and collecting acoustic noisemakers. It’s a spring going into a stretched material, like a drum head, which is surrounded by a high-density fiberboard tube. You shake it, the spring vibrates, and is amplified by the tube. And those lightning graphics? Sweet. But then, as discussed earlier, the EBow came into my life. I took one look at that spring and figured there might be EBow possibilities: it looked like a gigantic, loosely-wound guitar string. The results were pretty wild! The position of the microphone relative to the tube itself had a huge impact on the end result, but I wound up preferring the tone of the mic capsule being right at the lip of the open tube. The humble Crash Box: From cookies to crashes in 1,500 calories, and tasty either way. A “crash box” is a device to simulate the sound of, well…a crashing something. Originating in theater and radio productions, it’s a container with debris in it. You drop it, it crashes. You roll it, you get a slow trickling of debris. Simple enough. It’s something that an aspiring sound designer sees mentioned a lot in books and articles, but which “serious” sound designers might not use much. Why use a crash box when you have the budget to go to a junkyard and drop real cars on one another? Well, with no car-crash scenes or budget in sight, it still sounded like destructive fun, so I just had to make one. 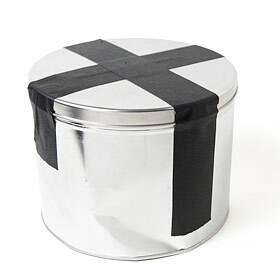 This past winter I got just the perfect container: a cookie tin from an appreciative design-industry acquaintance. The goal is to fill the container with glass, ceramics, rocks, busted-up bricks, sticks…pretty much whatever you’d want to have make noise. I picked debris that would best simulate a car crash: glass, plastic, ball bearings, metal bits, and rubber. The cost was US$0.00, unless you count the 4 cents of gaffer’s tape I used to hold the lid on. I recorded breaking those glasses separately before adding the debris to the crash box…which I also, of course, recorded as I poured it in. To get a bright sound with a low noise floor for the subtler tinkles and debris sounds, I used a large condenser microphone for these individual bits. I just had to break a coffee mug too, to see how that sounded. OK, fine: Two coffee mugs. Test time had arrived! I often record quiet sounds in a wool-carpeted dressing room in my house, since it’s the most acoustically dead free space I’ve got. I didn’t want the impact sound to pick up concrete or wood on impact, so the carpet was a good choice (sound blankets would have done in a different environment) I held the crash box above my head, right up against the ceiling and dropped it, tracking the loud crashes with a both a large condenser mic (farther away) and a small condenser mic up close. Such sweet mayhem! The raw recording it doesn’t quite get there in terms of realism, but mixed, shifted, and layered, crash boxes do make fantastic elements for any sort of destructive needs. Today’s sound is an example of several crash box clips and a few other “sweeteners:” the aforementioned breaking glasses, one low-frequency effect, and the sound of me kicking the door of a ruined pickup truck. To me, it sounds like a sonic illustration: maybe not perfectly photo-real, but evocative and expressive. 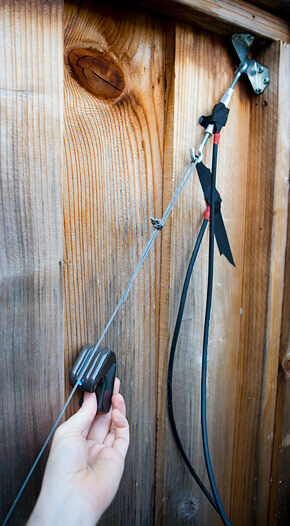 eBowing a tensioned cable on a fence gate. I mean, doesn't everyone spend their Sundays doing this? The eBow has been around for decades, and it does one thing only, albeit very well: It excites metal objects with a magnetic field. It’s meant to be used to get synth tones out of guitars, and used right, it can be beautiful. “Used right” usually doesn’t apply when I get my hands on such things. Having purchased an eBow this year, I didn’t sit and play my guitar with it. Instead, I switched it on and walked around the neighborhood looking for guitar-string-like objects that might make even more interesting noises. I came upon a fence gate that had a tensioned cable secured with a turnbuckle (to keep the large door from warping). While I could barely hear the cable resonate, I could also hear the wood of the door vibrating. To my mind, that meant only one thing: contact microphones. As you can see from the photo, I taped one contact mic to the turnbuckle, and another to the door. I didn’t want one on the cable to decrease its oscillation. I tracked each contact mic to a separate channel on my field recorder. I recorded about 16 minutes of pretty interesting tones, but the audio levels were quite low. The hums and drones were nice, but I liked it even better when the cable would strike and vibrate against the eBow itself, adding a sound like metal being stretched and warped. It sounded like a much more aggressive Alan Lamb recording. Perhaps someday I can use it expressively as a layer in some transformative or warping sequence, and certainly chopping it up to microsample it will yield untold button sounds, clicks, wonks, vrrrmmms, and other sonic sweetness. I layered some of the more dynamic, expressive parts into a short clip that you can check out below. These dudes could rock. Can you spot the Zoom H2? Belize has a really unique history as a Central American nation. First, it’s national language is English, not Spanish, but everyone there speaks a locale Creole that makes it sonically feel a lot more like Jamaica. Second, one of its most colorful ethnic groups is the Garinagu, who were a native people who lived in the region at the time of the slave trade (it was called British Honduras at the time), who sacked the slave traders and intermarried with their “cargo.” The Garinagu’s African roots run deep, so much so that drums are their icon and totem. 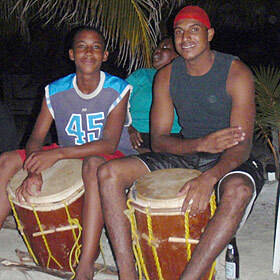 We had Garinagu guides when we visited Belize, and they were nice enough to have a night of song and dance on the beach. Once again, toting along the ol’ Zoom H2 allowed me to record part of the evening’s festivities. The sound is all surf (though it sounds like white noise), sand, drums, voices, sweat, and beer. The singers were dancing around a bonfire, hence the odd stereo panning; the recorder was about 8′ behind the drummers. Truly a night to remember. This nicotine-dispensing hulk is as playable as a drum kit. When we moved into our new office, there was this huge cigarette vending machine from the late 60′s or early 70′s left in our foyer. It went from monstrosity to curiosity, and now we’re happy it’s around as an ironic objet d’arte. It went from curosity to obsession once I realized that it could open and its metallic guts could be struck, strummed, and otherwise played like an instrument. This is one of those sessions I’ll redo someday with better gear, and with sound blankets to dampen the super-bright room (it’s far too heavy to move anywhere else! 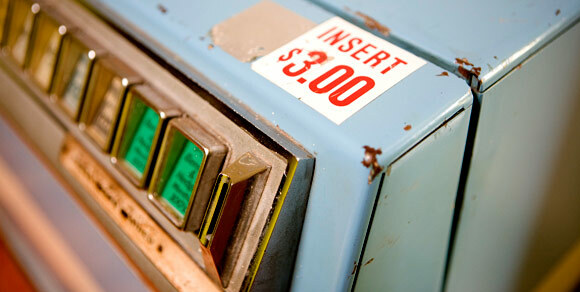 ), but these clips still evoke how expressive this machine is. Here’s a 30-second drum loop made from the raw sounds; the only processing is some EQ and compression. 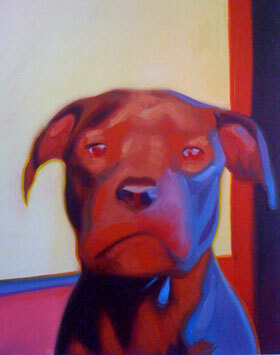 My friend and designer extraordinaire Jules has a dog named Sidney. Sid’s problem is that he has no idea that he’s a 100-pound pitbull-rottweiler mix. He’s a thick, massive canine with a chest twice the diameter of mine, yet he has the self-image of a happy-go-lucky, teensy lap dog. Jules was nice enough to let me do a recording session with Sid to get some elements for some creature sounds. I was after something low and menacing, but that didn’t require too much downward pitch-shifting, the du rigeur method of processing deep creature effects that often muddies up the sound by eliminating higher frequencies critical for realism. This was my first planned recording session with animals of any sort, and I learned a lot. The biggest lesson of the day? Put dogs on carpet or sound blankets to silence those claws! If you read my take on the Fostex FR2-LE, I hope I left you with the impression that is has some incredible strengths, but some physical interface issues that I just didn’t find ergonomically user friendly, and therefore not creatively enabling. 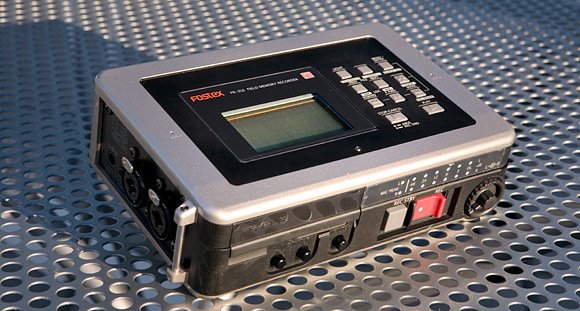 I ultimately found refuge in the Sound Devices 702 digital field recorder. Full Metal (Noise) Jockey: The Sound Devices 702 digital audio recorder. Sound Devices has taken the world of production audio by storm with bulletproof products whose price, while higher than many consumer models, establishes a new value baseline. Professionals have far more advanced models than this: models with more tracks, time code, and such ( those who can spend 6 bills swear by the Cantar, for example). For me, this unit has hit a sweet spot. Small (about the size of a hardcover book)! I’m not sure what to say here that others haven’t already said elsewhere about this very impressive machine. But upgrading to this level of machine reminded me of several lessons that, despite my advancing years, I still don’t always learn. Be bold with your research, specifically searching the name of the product you’re evaluating along with terms like “glitch,” “problem,” “error,” and even “catastrophic failure.” These little boxes are all expensive, objectively, so know what you’re getting into. Product and industry forums are your friend. High price never means perfection. “High price” is subjective, and you can never assume that next level up will solve all your problems. Even the 702 has its quirks, often due to its inherent (usually beneficial) complexity. At the end of the day, every device – from watches to cars – has its quirks and strengths. Just know what headaches you can live with and which ones will drive you crazy. A consumer’s self-knowledge is as important as feature sets. For me, the (very limited) caveats of the 702 don’t get in my way, which frees my mind to really focus on the recording. Today’s audio clip is a 30-second snippet of some frogs in a riparian canyon not far from my home. It was an incredibly blustery day, hence the mid-high frequency hiss in the background. I hunched down as best as I could on a tiny dry patch in the middle of a stream. I had to sit for about five minutes for the frogs to start up again, being spooked by my presence. The frogs remained unseen, but one must have been right in front of my shotgun mic, pretty loud and clear. The Fostex FR2-LE: superb value, challenging ergonomics in the field. Ah, yes. This little minx of a box was so very enticing and lovely: 24-bit recording, 96kHz sample rate, two solid and quiet mic preamps, pre-record buffers, FireWire, stupid-proof record button mechanism…why didn’t my relationship with the Fostex FR2-LE work out in the long run? Now, before we begin, don’t let me lead you astray: I loved the FR2-LE…for a while. Many, many people will love it as their one-and-only field recorder, and that’s awesome. It’s an insane value, especially if you get it (as I did) as a refurbished unit or one with cosmetic issues. For the price, you make some compromises – all plastic construction, noisy headphone amp – but in terms of pure value, seriously, nothing can touch it. I upgraded from the Zoom H2 because the H2′s external-microphone preamp was noisier than a colic child at a wake. Trying to plugging decent mics into it to get a clean sound was a total non-starter. With the FR2-LE (doesn’t that just roll off the tongue? ), there was so much to like. For its price class, I got the preamps I deserved – really clean, reasonably detailed. Good times. My relationship began to sour once I really started getting into field recording in a serious way, and two things arose that were problematic. The first was its insane system of needing to format Compact Flash cards for either mono or stereo. Yes, you had to switch cards to go from mono to stereo. Talk about killing the moment. But the other was the physical interface. Now’s a good time to remind my readers that I’m a professional interface designer, and I totally realize that price point and device complexity are huge constraints in designing a great user interface for a device as deep as this one. The FR2-LE’s biggest failing is its controls being laid out on two sides of the device. This device is meant to be used while hanging around your neck; it has LED audio meters on the top, but they’re so pale as to be literally invisible in the daylight. If you want to see the much clearer LCD audio meters, they’re on the side (from your point of view with it around your neck). In order to see it without using another hand, you need to extend your belly, or use a knee, or some other kind of contortion. I’d need to drink a whole lot more beer to get enough of a gut to be able to see this data without A) using a second hand (uh, what if I’m holding a boompole?) or B) looking like a hunchback in need of a pee break. If Fostex fixed those top LED meters, I’d still be using this unit daily. I bought a signal mirror and gaffer-taped it to the inside of its case, just so I could see those controls without needing to angle the FR2-LE in just the right way. Invectives aside, after about twenty excursions, I started to realize that this was going to drive me mad. This just wasn’t for me and how I wanted to work, ergonomically speaking. (Again, props to all who love the unit, such as Ric Viers of the Sound Effects Bible and many at the Nature Recordists group.) For now, it sits as a rainy-day backup unit in case my newer recorder needs servicing, or if I need two additional tracks for recording a tricky subject. What’s supplanted the FR2-LE in my daily recording? More on that in an upcoming post. For this post’s audio clip, here are some cool groaning metal samples from a cow gate in the hills of western Marin County, California. Rusty and resonant, just how I like it! 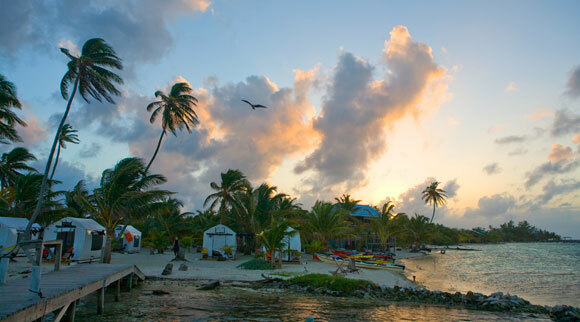 Sunset at Glover's Reef, Belize. I stayed at Glover’s Reef for a week last winter, an atoll 30 miles off the coast of Belize in the Caribbean. There was nothing out there but a small mesa of ancient coral, surrounded by 2 kilometers of deep sea, and a few of us kayaking and chilling out on an atoll barely a mile across. No lights from urban areas, not even any airplane flights overhead (that I could remember). It was the furthest linear distance from civilization that I’ve ever been. It was phenomenal. Nighttime was just as cool as the daytime. Bioluminescent worms zipped through the water at night, and there was no sound but the waves against the reef’s edge. Well…not quite. We were in heavy tarp tents (seen in the photo above), stretched over galvanized metal pipes, probably decades old. The winds hit us from unbroken western horizon, so the tents constantly groaned and creaked all night long. The metal frame had a “ping-yness” that one doesn’t usually hear in similar wooden creaks and groans.